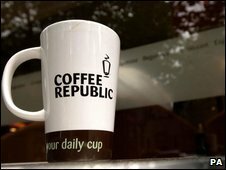 The coffee chain Coffee Republic has gone into administration, becoming the latest victim of the economic downturn. Twenty of its 187 UK outlets are directly-owned and affected by the administration. The rest are franchises or concessions in cinemas or hotels. The firm has 153 directly-employed staff, of whom 26 are based at its head office in London. Administrators at KPMG have warned that job losses are "inevitable" at loss-making outlets. The chain was formed by Bobby and Sahar Hashemi, a brother and sister team, and opened its first branch in 1995 in South Molton Street, London. Richard Hill, KPMG partner and joint administrator, said: "The recession is hitting discretionary spending on the High Street and some of the less profitable bars with expensive leases have suffered. "However, Coffee Republic has a strong brand and I expect considerable interest in the profitable parts of the business. "We will be doing whatever we can to find a buyer for the residual business as a going concern as quickly as possible, so interested parties will have to be prepared to move fast." KPMG has been appointed to Coffee Republic (UK), Coffee Republic Franchising and Goodbean, although holding company Coffee Republic plc is not in administration. Outside the UK, Coffee Republic has outlets in 10 other countries including Saudi Arabia and Bulgaria. The UK has more branded coffee bars than anywhere else in Europe, according to the consultancy Allegra Strategies. The three biggest players are Starbucks, Costa and Caffe Nero.